These days, I work on making, labeling, packing, and shipping soap for a few hours before I go to work and then another few hours when I get home. We had a super strong launch, including adding several wholesale accounts months ahead of schedule, and are looking forward to a really busy holiday season. 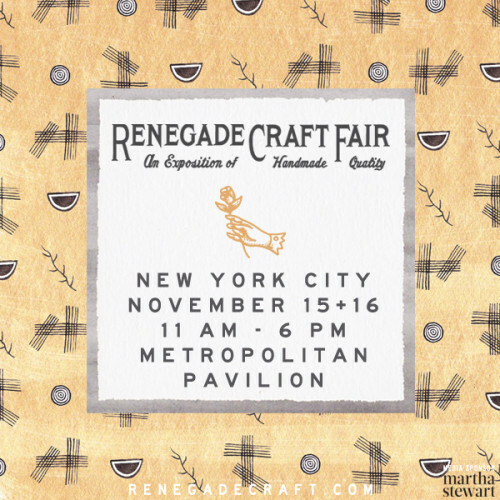 The Renegade Craft Fair is a big part of that. Schoon Soap will be in booth 149A and we’d love to see you there! We’ll be launching out some limited-edition holiday varieties (anything that sells out may not be available again until next winter): Gingerbread, Fir Tree, and Frankincense & Myrrh, plus a charcoal Krampus soap for the naughtier names on your list. So, I’m starting a soap company. It’s been strange to have had such a big project in the works for months without even hinting about it here, but it’s been a lot of fun too. 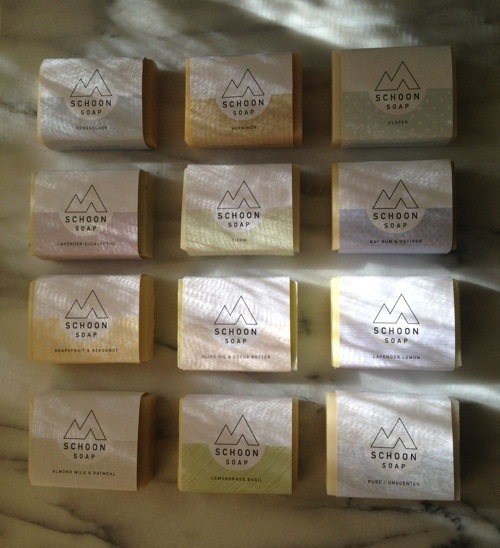 Schoon Soap–‘schoon’ means clean in Dutch–is luxury soap made in small batches without palm oil (because orangutans), synthetic fragrances, or animal products of any kind. Since it takes about a month from when soap is made to when it can be used, the R&D and testing phases were pretty extended. I spent several months developing a base formula that produced soap that would be hard and long-lasting–it’s the palm oil and animal fats that contribute those qualities to commercial and many handmade soaps and since I wasn’t using those, finding other ways to achieve those qualities took some doing–but also rich and moisturizing. The final recipe uses coconut, olive, sunflower, avocado, and castor oils, as well as shea butter, to achieve that balance. Then I spent another few months developing the fragrance line. There are three varieties that have no added fragrance whatsoever: a completely Pure/Unscented one; one with homemade Almond Milk and Oatmeal; and the only variety that uses a different base: Olive Oil & Cocoa Butter. The other varieties include Grapefruit & Bergamot, Lavender Lemon, Lavender Eucalyptus, Bay Rum & Vetiver, and Lemongrass Basil, in addition to more complicated fragrances that I named after counties in New York State: Ulster (geranium, ylang ylang, West Indian sandalwood, black pepper), Tioga (cedarwood, fir needle, juniper, petitgrain, black pepper), Rensselaer (howood, which is a more sustainable and less expensive alternative to rosewood, cardamom and nutmeg), and Herkimer (clove, cinnamon, rosemary, eucalyptus, and litsea). My goal for the launch date is 9/15, so I’ll be in heavy production mode until then. There’s still a lot left to do–finalizing product descriptions and other text for the site, getting tax IDs and the other staying-one-step-ahead-of-the-law details worked out, sorting out shipping details. Rob will be handing shipping and customer service since he’s good at that sort of thing and I’m not available during the day. We’re starting out small and will be selling strictly through Etsy at the beginning, but I have a lot of ideas for things I’d like to do and ways I’d like the company to grow and I’m really looking forward to getting this show on the road.